Have you seen the movie ‘The Greatest Showman’ with Hugh Jackman? Jackman plays the ambitious P.T. Barnum. I don’t want to give away anything in the movie if you haven’t seen it. Suffice it to say, the circus finds their footing when they realize they can take their show on the road (via tent) and the rest is history…. Similarly, the Atlanta Tandem User Group (ATUG) took the show on the road this year and by all accounts, the show was a big success! 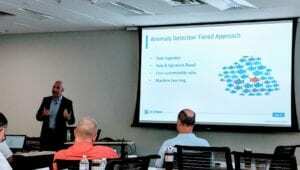 This years ATUG was hosted at the HPE Customer Solution Center in Alpharetta Georgia on the northside of Atlanta. The venue is one of four Customer Solution Centers in the US and they are used to showcasing HPE’s capabilities and rolling out the red carpet for guests. A big thanks to the HPE team for helping pull this all together. Ken Goldman, Nelson Alvarez, Theresa Norton were all instrumental in securing the facility as well as helping with the agenda. Patrice Yunits did the heavy lifting by coordinating all the logistics. ATUG is completely funded by the vendor partners and sponsorship. No admission fee is charged to attendees and no admission fee has been charged to the speakers or vendors in attendance. Rather, Partners that have stepped forward as good stewards of the industry offer to pay for the breakfast, lunch, afternoon break and cocktail reception. Special thanks to those sponsors for this year’s event: Ascert, Omni Payments, CSP, ComForte, Integrated Research and XYPRO. Unlike P.T Barnum’s circus, which was able to take their show on the road in tents, ATUG has thus far been fortunate enough to have access to client or HPE facilities to help make ends meet. Next year is no different. So, if you’re reading this article and in the Atlanta area, we are always looking for new venues and places to hold next year’s meeting. The day got off to a good start with Kevin McDowell, Group Manager, HPE providing a comprehensive product Roadmap update to the group. Afterwards, Mark Flanigan, HPE Manager gave the group an overview of the HPE OneView environment where we received a demo of the HPE Virtual NonStop and we ended the session with a tour of the HPE Solution Center. After lunch the group heard from Greg Swedosh from Knightcraft Technology as ATUG’s special guest speaker. Greg’s topic: ‘Security? A never-ending story’. This was a great presentation that spoke about the structured approach to performing a security review of the HPE NonStop environment using many of the top security products vendors have to offer. The HPE NonStop hardening guide, partnered with a product like XYGATE Compliance Pro, is a great start for companies to use when performing their own security review. On the upside, Greg is a good speaker and clearly a master of his trade. On the down side, he had a nasty cold from the long flight from Australia and probably passed that on to several folks, myself (and now my wife) included. ATUG didn’t have three rings, elephants or lions. We didn’t have high wire acts. 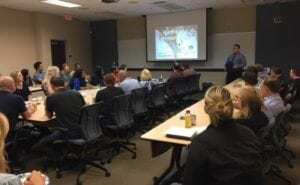 We did have a group of very knowledgeable HPE NonStop professionals who came together to share information and learn from one another. A big thanks to all that attended and participated. A special thanks again to Kevin McDowell, Mark Flanigan and Greg Swedosh for all of the extra effort you put in, making this year’s ATUG another solid event. And, thanks to Ken Goldman and HPE as we didn’t have to move into a tent!